To celebrate the holiday season we returned to The Blackbird's upstairs private suite to sip from the society cellar. 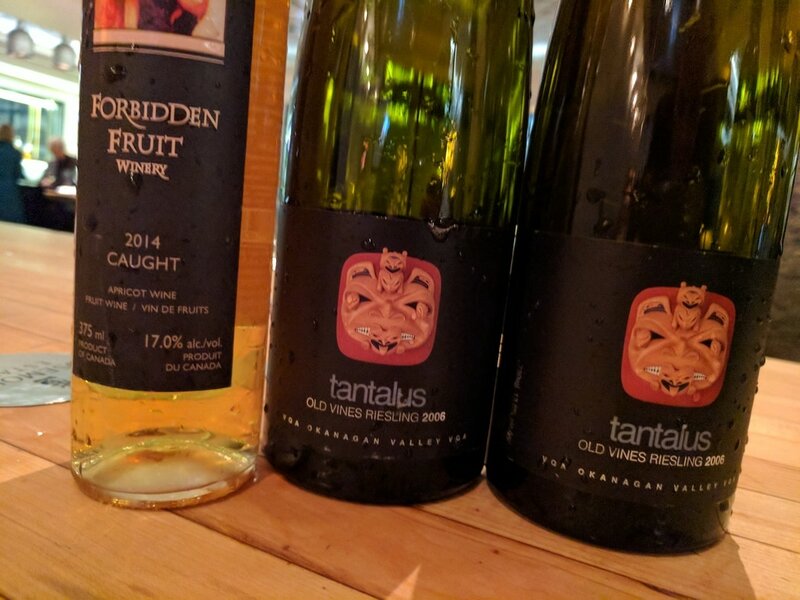 Some amazing old vintages were brought out of hiding for our enjoyment: 2006 Tantalus Riesling, 2006 Jackson-Triggs Sunrock Shiraz, 2006 LaStella Maestoso were the incredible tip of the iceberg! Well aged 2008 Cabernet Sauvignon from La Frenz and the dreamy 2008 Josephine red blend from the sadly-defunct Herder Winery in Keremeos. Along with reams of culinary delights from the Blackbird kitchen we even tried the Lieutenant Governor's Award-winning 2010 sparkling "The One" from Noble Ridge. The warm and wonderful evening made for a perfect opportunity to share well wishes for the busy weeks ahead! An incredible "double blue" evening saw us visiting Vancouver's famous Blue Water Cafe & Raw Bar for a winemakers dinner with the Mavety family of Blue Mountain Vineyards. The renowned Okanagan Falls winery known for their Burgundian focus and fine sparkling wines was the perfect match for the five course menu we enjoyed. Memorable matches included Crab Beignet with 2015 Pinot Blanc, Arctic Char with 2015 Sauvignon Blanc, Albacore Tuna with 2015 Gamay, and Duck Breast with the newest 2013 vintage of Blue Mountain's famous Reserve Pinot Noir. The gorgeous presentation of every plate continued into dessert where Cranberry & Goat Cheese Galette made friends with the 2012 Brut Rose to cleanse our palates before petit fours. The presence of winery founders Ian & Jane Mavety, plus their talented winemaker and son Matt made for a rare and valuable experience to explore this legendary BC winery. Our traditional autumn harvest festival was revamped into a celebration of the many wineries visited on our Fall Bus Tour. The sold out tour was a huge success, but the rest of our members deserved to enjoy the spoils as well, and our Cellarmaster had carefully collected a slew of bottles for the home team! The tour of Oliver-Osoyoos and the Similkameen Valley had yielded everything from crisp sparkling to sumptuous Apricot dessert wine, all enjoyed with cheese platters of course. Wines included Orofino Moscato, River Stone Pinot Gris, Quinta Ferreira Chardonnay, Clos du Soleil Rosé, C.C. Jentsch Syrah, Quinta Ferreira's Obra Prima red blend, Corcelettes' Menhir Bordeaux-style blend, and the rich Forbidden Fruit "Caught" Apricot Mistelle, among others as well! It was a wonderful evening celebrating all the best from some of the Society's loyal winery friends. 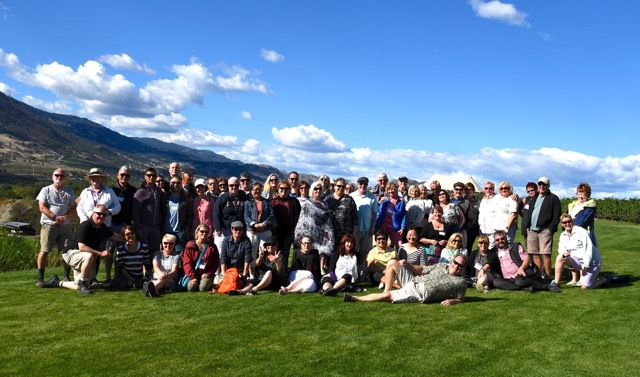 The annual Bus Tour visited Osoyoos this year, sending a sold-out crowd to visit the Similkameen Valley, and the Black Sage Bench and Golden Mile on day two. Launching our valley visit with a literal earthquake at Hugging Tree was a new experience, followed by stops at Eau Vivre, a beautiful sunny lunch at Clos du Soleil, and Corcelettes and Orofino in the afternoon. Forbidden Fruit joined us for dinner that evening on the beachfront lawn at Watermark Resort. Tours of River Stone and Quinta Ferreira kicked off Sunday, followed by a windy Joy Road Catering lunch at Church & State, plus Stoneboat and an exciting conclusion at C.C. Jentsch. Spending a warm summer evening overlooking the Vancouver harbour and north shore mountains provided the perfect setting in which to taste superb BC wines with good friends and fine food. The delicious spread from our corporate member Casalinga Foods was simply stunning, feeding the appetites of plenty of hungry people seeking something special. Gems such as Tuna Avocado Cups, Coconut-bread Lobster Fingers, and Smoked Salmon in Beet Cups kept guests coming back for more and more! We sipped on some special local treats like Stoneboat's Fax Pas Rose Brut, Bench 1775 Malbec Rose, and Terravista's beautiful and rare Albarino, plus cellar selections including Poplar Grove 2011 Syrah-Viognier, Mission Hill 2008 Compendium, and Herder 2007 Josephine. 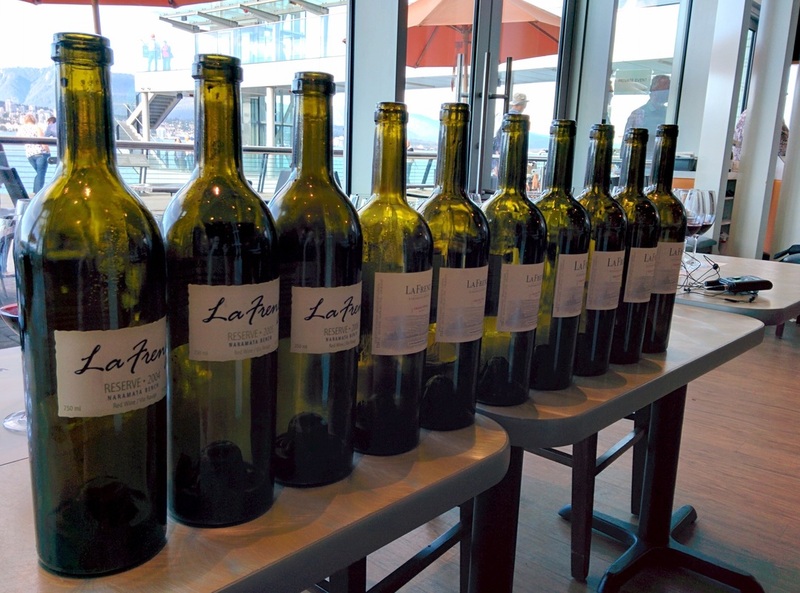 Digging into the BCWAS cellar allowed us to enjoy a lengthy vertical tasting of La Frenz Winery's "Grand Total" icon red blend. Owners Jeff & Niva Martin visited and brought the latest 2013 vintage to ensure we had the decade from 2004 onward. Seeing the evolution in style and complexity as the Martin's vineyards evolved over the years was fascinating. Hearing about Jeff's focus on biodiversity and natural farming in his vineyards was inspiring - in the past ten years he hasn't needed to fertilize or even water! Despite the age of the wines we enjoyed 2004 was the only one Jeff felt was in need of current consumption, while guests particularly cherished the 2007, 2010, and new 2013 vintages. 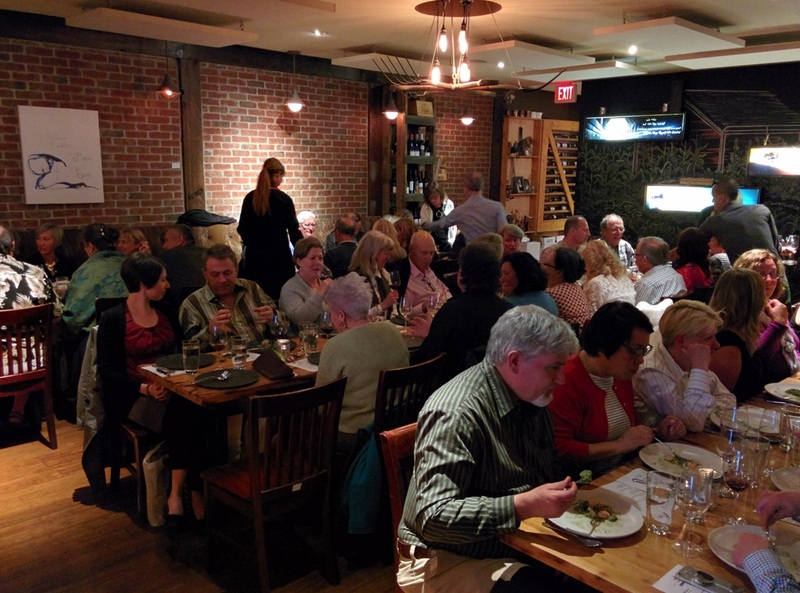 John & Virginia Weber from Similkameen Valley winery Orofino Vineyards joined another sold-out crowd of members at Kitsilano's fabled Fable Restaurant for a spectacular five-course winemaker's dinner. Thanks to the masterful preparation of Chef Max Straczek and the talented culinary and hospitality team we enjoyed one of our best dinner's ever! 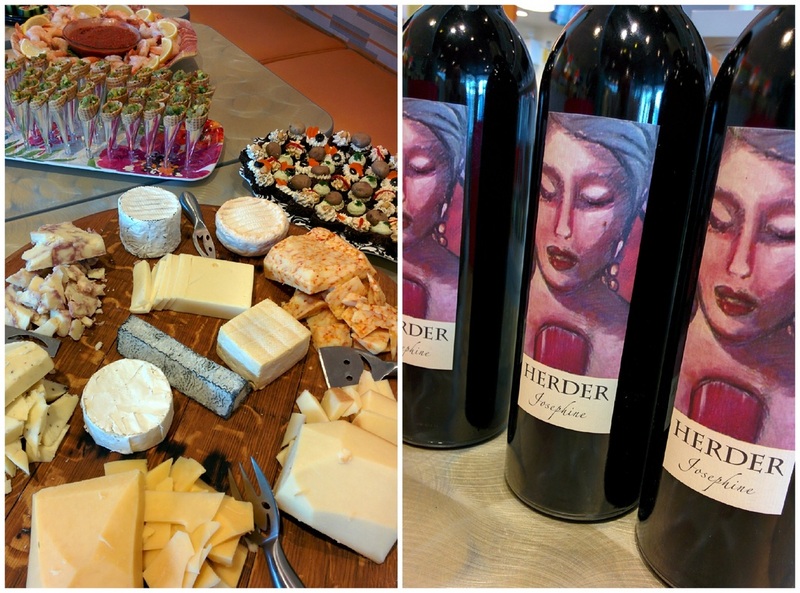 Outstanding food was paired with wonderful gems from Orofino's cellar, like 2009 Riesling and 2011 Single Barrel Merlot (sent only to the winery's "Collector's Club"). Even the dessert of Black Bean Cake and Cocoa Ice Cream & Cappuccino Gel sang in beautiful harmony with Orofino's dry red blend Beleza. Assuming we don't simply go right back to Fable again next year this will be a hard one to top! Stefanie Schales travelled from Summerland to share the broad range of wines produced at her family's 8th Generation Vineyards. Stefanie and her winemaker husband Bernd founded their family winery in 2007 after immigrating from Germany. We were lucky enough to enjoy no less than four complex Riesling, two refreshing Frizzante, and the winery's coveted Pinot Meunier Rose among others. The brand new 2015 Rose is expected to sell out by June, however the 2015 Riesling Selection we previewed is awaiting a September release as it bottle-ages. The new 2015 RedOne provided rare unoaked Merlot & Syrah for chilled summer sipping - think spritzers or even sangria! 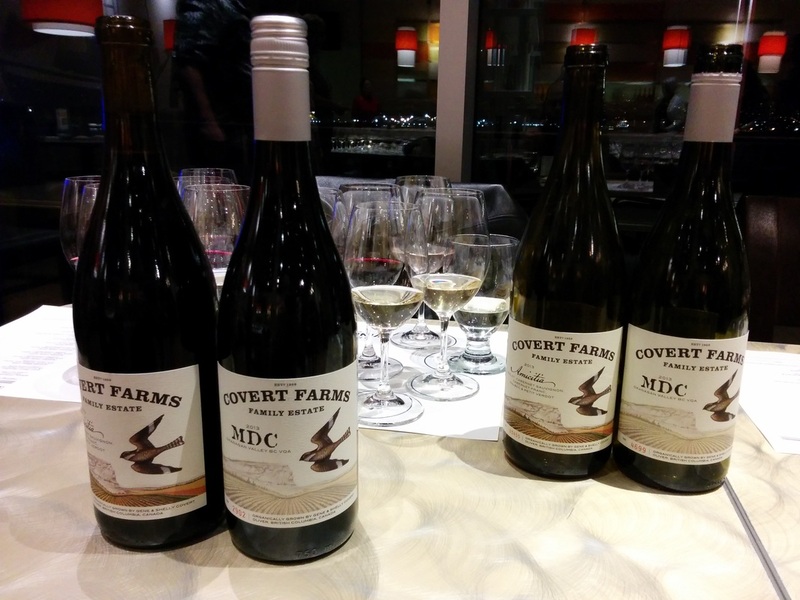 After spending some time exploring world wines in February at the Vancouver International Wine Festival we reconvened in March to welcome Derek Uhlemann from Covert Farms Family Estate Winery in Oliver. Derek shared some very exciting new and upcoming releases, including a deliciously dry Sparkling Zinfandel, plus a some aged Amicitia White (Roussanne/Viognier) and tastes of Covert's current vintage reds. We relished 2013, 2014, and 2015 barrel samples of the Grand Reserve series reds Zinfandel, Cabernet Sauvignon, and Merlot. 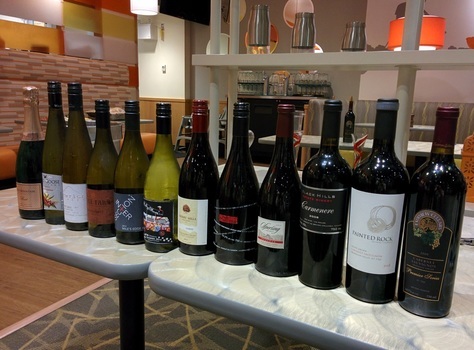 We kicked off the New Year with a great walk-around tasting of wines from the BCWAS cellar. A full range of sparkling, whites, and reds tempted the palates of the sold out crowd, along with platters of cheese & charcuterie from Les Amis du Fromage. 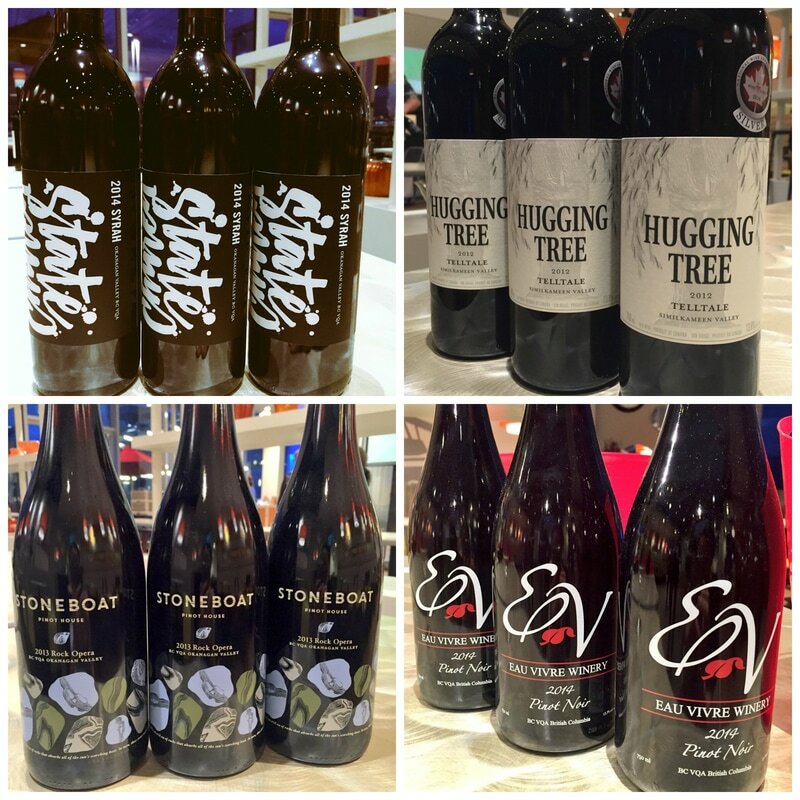 Some big highlights included the first vintage (2008) of Laughing Stock's delicious Syrah, the beautiful Ruby Blues 2014 Viognier, and a rich and ripe 2009 Cabernet Sauvignon from Oliver's Fairview Cellars.